Vineyard Villa tapestry shows a lively scene from the Tuscan countryside. A villa with a backyard setting is seen before the hills of the Mediterranean. Lovely vines are climbing the garden as the purple flowers add color. The countryside of Italy are an inspiration for artists through the centuries, and here we see a homely scene of life in the warm and sunny region. 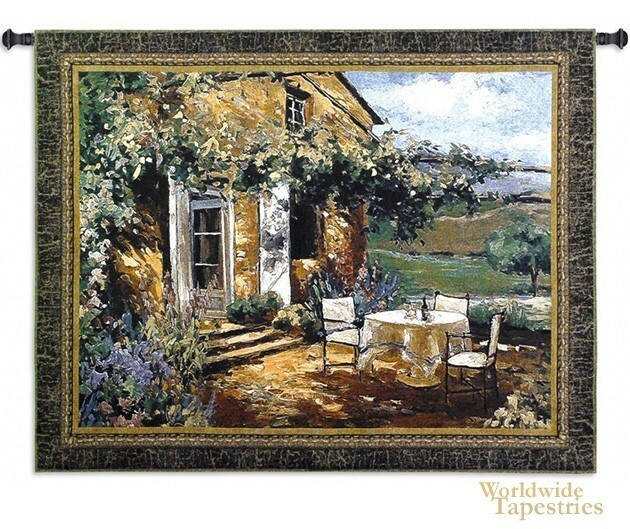 This Vineyard Villa tapestry is backed with lining and tunnel for easy hanging. Note: tapestry rod and tassels, where pictured, are not included in the price.